← MY FAVORITE TOP TEN TUESDAY! I am a bit mad at myself right now. So perhaps I overreached a bit thinking I could do both a book and a movie review in short order. I’ve finished the book and yet again I surprised myself because on my now third read-through, I actually enjoyed it greatly. The first two times I thought it was pretty weird. But I still haven’t had time to watch the movie, and I’ll be honest, the movie was always my first love. So no go on the review yet because I really desperately want to do two-in-one even though it will be hard. 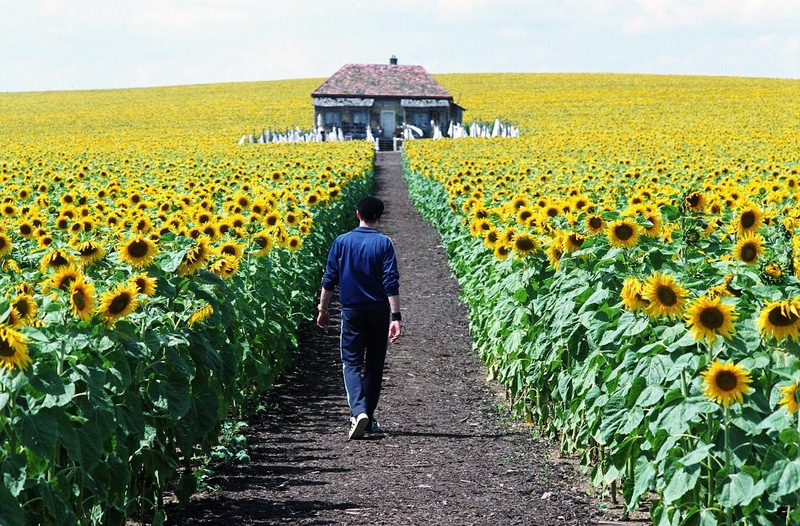 In the mean time feast your eyes on the field of sunflowers from the movie. They look authentic or at least CGI authentic since I honestly can’t tell if they are real or not. 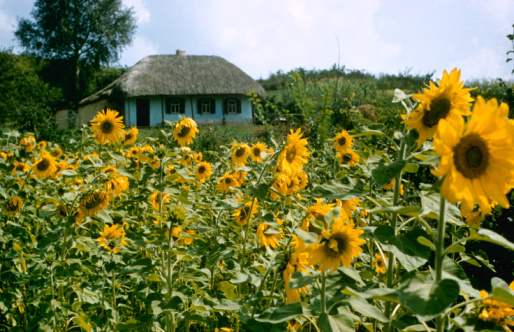 My fondest childhood memories of Ukraine always involve fields of sunflowers in the summer. Dad would drive the car to a lake or a river where everyone would have a picnic and swim, and then on the way home, we would always drive by sunflower fields (in fact I have a very strong memory of running up the hill from where we picnicked to grab them and smell them) and stop to collect a few so that mom would roast the sunflowers at home until blackened and we would snack on them for ages. This is closest to what they looked like in my memory. A lot of the houses in my hometown looked very much like this. It actually made me sad just now trying to find a lovely photo so that people could see what I meant because so many photos of Ukrainian sunflower fields on Google are coming up with images of the Ukrainian army or the separatists in Eastern Ukraine, or even worse with images of the downed flight last year in a field of sunflowers. So instead I am going to hold onto the image above to give you an idea of what my childhood really looked like. And hopefully it will be enough until I can watch the movie and amaze you (probably not) with my superb observations. I still have yet to watch this movie and seeing the scenes makes me want to watch it so bad. Back on the hunt for this one! Having read the book I can only imagine! It’s a beautifully tragic story.